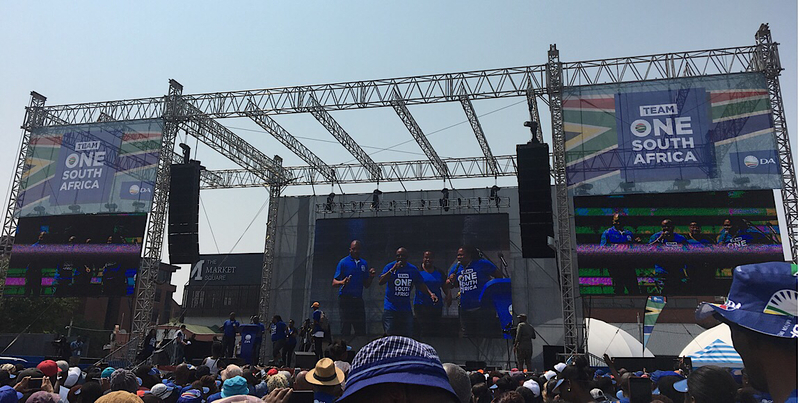 The Democratic Alliance has targeted winning the Gauteng and North West premierships as part of its 2019 elections strategy. That means either finding a million new votes in Gauteng alone, or hoping that the Economic Freedom Fighters whittle away enough at the African National Congress majority that another coalition deal can be struck. Look, the long and the short of it is that the DA need to find one million new voters, and keep all the votes it got in 2014, to have a shot of winning the Gauteng province outright. Those are the numbers. The ANC got 54% of the vote with 2,348,564 votes. The DAâ€™s 1,349,001 votes got it to 31%, and the EFFâ€™s 451,318 voters got it a modest 10 percent. I have been writing about the DAâ€™s attempts to get Gauteng for more than seven years now. I think itâ€™s fine to say that it probably will not succeed in 2019. Insider polling points to moderate growth. At a press conference ahead of the partyâ€™s manifesto launch on 23 February, party spindoctor Siviwe Gwarube said that the party expects to â€œimproveâ€ on the 2014 numbers, with a target on reducing the ANCâ€™s share to below 50% in Gauteng and the Northern Cape. However, she would not commit to a number. Not even the mythical 30 percent. So it seems obvious that coalition politics are the DAâ€™s gambit. I wouldnâ€™t be too swayed by articles pointing out that the DA-EFF â€œcoalitionâ€ experiment in the metros has yieldedâ€¦ mixed results, shall we say?Â Personality comes into it a lot, and where Athol Trollip failed, Herman Mashaba is succeeding. So itâ€™s not as if the idea of the liberal DA and Marxist-Leninist-Fanonian EFF working together to deprive the ANC (whatever the hell its ideology is nowadays) of power is completely preposterous. Neither party likes acknowledging this fact, but the best way for the DA to dislodge the ANC from Gauteng is for the EFF to take away enough voters from the ruling party so that it may once again become a kingmaker.Â Itâ€™s as simple as that. Everything else you hear is just partisan posturing. Subscribe to Siphoâ€™s Weekly Political Newsletter. What Is The Wits SRC Humanitarian Fund That AKA Donated R100k To?